SACRAMENTO, Calif. (AP) — An Assembly resolution urging California colleges and universities to squelch nascent anti-Semitism also encouraged educators to crack down on demonstrations against Israel, angering advocates for Muslim students. With no debate, lawmakers on Tuesday approved a resolution that encourages university leaders to combat a wide array of anti-Jewish and anti-Israel actions. “California schools need to recognize that anti-Semitism is still a very real issue on college campuses around the state — it did not disappear with the end of World War II,” said Assemblywoman Linda Halderman, R-Fresno, the resolution’s author. Most of the incidents of anti-Semitism the resolution cited are related to the Israel-Palestine debate. These include instances of protesters comparing Israeli police to Nazis and urging support for Hamas. The resolution, which is purely symbolic and does not carry policy implications, also condemns the suggestion that Israel is a “racist” state and that Jews “wield excessive power over American foreign policy.” The resolution characterizes the student campaign to pressure the University of California system to divest from Israel as anti-Semitic, and applauds university leaders’ refusal to consider it. The Council on American Islamic Relations said the resolution went too far and constituted an attack on students’ right to free expression. Roberts said the council was disappointed that the resolution was drafted and passed while California colleges were out of session. Pro-Palestinian protests have become a regular occurrence on many University of California campuses. Students sometimes use sensational tactics including simulating checkpoints and combining swastikas with the Star of David. In 2010, 10 Muslim students were convicted of misdemeanors for repeatedly interrupting a speech by Israeli Ambassador Michael Oren at UC Irvine, where students were suspected of painting swastikas in university buildings. The Assembly’s actions also drew criticism from free speech advocates. Carlos Villarreal, director of the San Francisco chapter of the National Lawyers Guild, called the resolution irresponsible and dangerous because it combines legitimate condemnations of acts of intimidation and hate with specific objections to tactics used to support the Palestinian people. “In doing so, it can be seen as having no other purpose than to demonize all those who criticize the nation-state of Israel or support the rights of the Palestinian people,” he said. Halderman did not mention Israel when she introduced HR35, which passed on a voice vote with 66 of the Assembly’s 80 members signing on as co-authors. Some of the lawmakers who signed on as co-authors when the resolution was called on the floor seemed surprised to later learn of the references to Israel. Assemblyman Tom Ammiano, D-San Francisco, was one of the few who did not support it. “Ignorance reigns up here,” he said. One of the resolution’s co-authors, Assemblywoman Bonnie Lowenthal, D-Long Beach, said she understood critics’ concerns. The California Legislature has no Muslim members, according to the council. Hezbollah terrorists have built a vast, multimillion-dollar “holy war” theme park to teach children the glory of losing their lives fighting against Israel. The Museum for Resistance Tourism, constructed on a former war zone in the southern Lebanon town of Mleeta, features models of heroic Hezbollah fighters, destroyed Israeli tanks and a “Martyrs Hill” garden, decorated with guns and missiles. Visitors begin their tour in a theater with a seven-minute video history of Hezbollah, which fought a 34-day war with Israel in 2006, during which 160 Israelis were killed. Outside, tourists can see the remains of fierce clashes with the Israelis, including trophies like a destroyed Merkava tank whose cannon has been twisted into a pretzel. Visitors, including children, are encouraged to take turns raising and lowering an anti-aircraft gun as to fire at incoming Israeli air force jets. Also on the sprawling, 60,000-square-yard grounds is a Hezbollah bunker and a 200-yard underground tunnel, with a kitchen, prayer hall and living space for 30 men. It was used to hide fighters from the Iran-backed group during the 2006 cross-border war that ended without a victor. More than half a million people visited the park, which lies about 50 miles from Beirut, in the first three months after it opened in 2010. Hezbollah leaders have indicated that the park, which is officially sanctioned by the Lebanese government, will be expanded with some less ideological amenities — like swimming pools and playgrounds. But as it stands, it looks like a prime target for Israeli bombers in the future war that both sides say is inevitable. Nasrallah hinted yesterday that Hezbollah now has nuclear weapons. In a speech to supporters in southern Lebanon, he said his group could turn the lives of hundreds of thousands of Israelis “to real hell” by launching precision-guided missiles. “We can change the face of Israel,” he threatened. “We all know that the Islamic republic’s response will be very great and thunderous if it is targeted by Israel,” he said. His comments came as the US Embassy in Beirut warned American citizens in the country to be aware of “an increased possibility of attacks” in Lebanon. 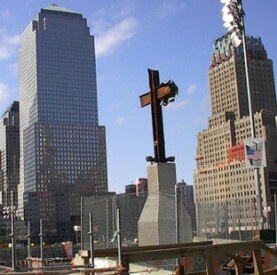 A lawsuit that challenges the placement of the cross at the site of the 9/11 attack on the World Trade Center alleges atheist plaintiffs have suffered serious physical and mental illness because the religious symbol has made them feel excluded. Nonsense, says a new friend-of-the-court brief to be filed Monday in the case by the American Center for Law and Justice. The brief, which carries the signatures of more than 100,000 people, argues there have been no known sightings of suicides or uncontrolled vomiting at or around the Ground Zero cross. “The legal argument is absurd,” ACLJ Chief Counsel Jay Sekulow charged Wednesday. The group contends the placement of the 17-foot-tall symbol at the National September 11 Memorial and Museum is making some atheists unbearably sick. If American Atheists’ demand to remove the cross doesn’t succeed, organization officials already have an alternative: something else must be erected next to the cross. “They even make a bizarre suggestion about erecting a ’17-foot-high A for Atheists’ to promote their non-beliefs at the site,” Sekulow said. The American Atheists group is suing numerous individuals and organizations over the cross, including New Jersey Gov. Chris Christie, New York City Mayor Michael Bloomberg, the National September 11 Memorial and Museum, World Trade Center Properties, Church of the Holy Name of Jesus and Friar Brian Jordan, who blessed the cross. The main point of the action appears to be the indignation American Atheists President David Silverman feels about the God of the Bible and those who express faith in Him. Silverman and other atheists argue that the cross unconstitutionally represents the government’s establishment of religion, but Sekulow disagrees. “Our initial legal analysis of their complaint reveals that while the lawsuit argues that it is unconstitutional to ‘plac[e] a religious symbol of Christianity on government-owned property,’ it ‘fail[s] to note that the cross is actually a remnant of the ruins of the Twin Towers,’” Sekulow shared. Christian organizations aren’t the only ones who concur. The ACLJ points out three out of four Americans have said they support the Ground Zero cross. The Christian legal organization also notes that the cross has strong support from the Anti-Defamation League. Even Silverman himself realized his legal attack on the cross would gain little to no support. “As president of the American Atheists organization, I promise to make sure that everyone, even those who are indifferent to our cause … will hate us,” the American Atheists president said. Silverman is no stranger to unpopular protests. His organization took a stand against the city of New York naming a street “Seven in Heaven,” contending the title honoring seven first-responder firefighters who died on 9/11 drew a biased link between Christianity and heroism. The Freedom From Religion Foundation entered into a decade-long lawsuit to remove a World War I memorial cross – erected in 1934 in a remote area of California’s Mojave Desert – because it offended an atheist who happened to hike near it. A court ordered the cross to be covered, and it eventually was stolen while the lawsuit was moving forward. After going to the U.S. Supreme Court, a land swap was approved. Months ago in Camp Pendleton, Calif., the Military Association of Atheists and Freethinkers, Americans United for the Separation of Church and State and the Freedom From Religion Foundation pushed the U.S. Marines to remove a cross on the base that was erected to replace a cross that burned down. The crosses were put up to honor fallen soldiers. But MAAF had another way of looking at the cross. ACLJ Director of International Operations Jordan Sekulow said the atheists seem to be getting their way. The judge says allowing the suit to go forward would risk divulging sensitive state secrets. Several groups had sued over the activities of an FBI informant. A federal judge Tuesday threw out a lawsuit filed against the U.S. government and the FBI over the agency’s spying on Orange County Muslims, ruling that allowing the suit to go forward would risk divulging sensitive state secrets. Carney allowed the suit to stand against individual FBI agents under the Foreign Intelligence Surveillance Act, which allows those who were improperly subjected to electronic surveillance to sue. The lawsuit was centered around the actions of Craig Monteilh, who alleges that he posed as a Muslim convert at the behest of the FBI to collect information at Orange County mosques. The American Civil Liberties Union of Southern California and theCouncil on American-Islamic Relations sued on behalf of community members who alleged that the FBI engaged in a “dragnet” investigation that indiscriminately targeted Muslims based on their religion, planted bugs in offices and homes, and listened in on private religious conversations. Attorneys for the plaintiffs said late Tuesday that they would appeal the judge’s decision. He claimed to have conducted surveillance in about 10 Southern California mosques using sophisticated audio and video equipment. Monteilh has separately sued the government, alleging that his rights were violated and that his life was endangered while working as an informant. Giuliano also filed additional declarations shielded from public view that Carney said he “heavily relied upon” in reaching his decision. Department of Justice attorney Anthony Coppolino told Carney in court Tuesday that to parse through the truths, half-truths and falsehoods in Monteilh’s statements was not possible without wading into sensitive, privileged information. Attorneys representing two agents who allegedly acted as Monteilh’s “handlers” and their supervisors argued that their clients were prevented from fighting the claims because the information about why and how they conducted their investigation was classified. Carney, a former private attorney, was appointed to the Orange County Superior Court by Democratic Gov. Gray Davis in 2001. He was nominated to the federal bench by Republican PresidentGeorge W. Bush a year later. (CNSNews.com) – The U.S. State Department removed the sections covering religious freedom from the Country Reports on Human Rights that it released on May 24, three months past the statutory deadline Congress set for the release of these reports. Leonard Leo, who recently completed a term as chairman of the USCIRF, says that removing the sections on religious freedom from the State Department’s Country Reports on Human Roghts is a bad idea. Since 1998, when Congress created USCIRF, the State Department has been required to issue a separate yearly report specifically on International Religious Freedom. But a section reporting on religious freedom has also always been included in the State Department’s legally required annual country-by-country reports on human rights–that is, until now. And this is the first year the State Department would have needed to report on the effect the Arab Spring has had on religious freedom in the Middle East–had its reports, as always before, included a section on religious freedom. “The commission that I served on has some real concerns about that bifurcation, because the human rights reports receive a lot of attention, and to have pulled religious freedom out of it means that fewer people will obtain information about what’s going on with that particular freedom or right. So you don’t have the whole picture because they split it up now,” Leo told CNSNews.com. Former U.S. diplomat Thomas Farr says it’s possible that the move to totally separate religious freedom from the human rights reports could simply be a bureaucratic maneuver. But another possibility is much more likely. “The other possibility is the Obama administration is downplaying international religious freedom,” Farr said. Farr, who served in the State Department under both Presidents Clinton and George W. Bush, was the first director of the Office of International Religious Freedom. Currently a visiting associate professor of religion and world affairs in the Edmund A. Walsh School of Foreign Service at Georgetown University, Farr directs the program on Religion and U.S. Foreign Policy and the Project on Religious Freedom at the Berkley Center for Religion, Peace and World Affairs at Georgetown. He told CNSNews.com that far more resources have been allocated by the Obama administration to other human rights issues than have been directed toward religious freedom. “(T)he ambassador-at-large for international religious freedom, for example, who is the official charged by the law to lead U.S. religious freedom policy, did not even step foot into her office until two-and-a-half years were gone of a four-year administration,” he said. “Whereas other human rights priorities of the administration, such as the ambassador-at-large for global women’s issues, were in place within months. So that tells you something. “It tells me that this has never been a priority for the Obama administration, and it’s not now,” he said. The 2010 International Religious Freedom Report is notably missing some important information–the two-year old report contains no mention of the violence, murder and mayhem directed at Christians and other minorities in Muslim nations in Africa and the Middle East since the Arab Spring uprisings of 2011. However, the less well-known 2012 report of the U.S. Commission on International Religious Freedom does take note of the Arab Spring. — In 2011, in Egypt, Coptic Christians were among 25 people massacred during a demonstration over an Islamist attack on a church. — In the month of January 2012 alone, the Islamist group Boko Haram was responsible for 54 deaths in Nigeria – 42 of them Catholics killed at church on Christmas Day. In 2011, it killed more than 500 people and burned down or destroyed more than 350 churches in 10 northern states of Nigeria. Former USCIRF Chairman Leo says the fact is the administration no longer makes the proper distinction between freedom of religion and freedom of worship. “Going all the way back to the president’s speech in Cairo, they seem to be satisfied with Arab Spring countries and Middle Eastern countries providing freedom of worship, but not pressuring them on the broader freedom of religion. “In Saudi Arabia, and in some of these countries, you may be able to draw curtains in your home and pray–but don’t take it outside your house. And certainly don’t imbue other aspects of your life with your religious sentiments,” Leo said. Former diplomat Farr agreed the administration hasn’t been focused on the freedom of religion in terms of foreign relations. “As far as I know, the administration has paid very little attention to the religion-state issues, in terms of policy effort, in terms of programs on the ground,” Farr said. The State Department, meanwhile, has given no indication of when — or if — the next International Religious Freedom Report will be released. Local Muslims are asking for the removal of a state-contracted counter-terrorism instructor whom they say spreads false information about their religion and encourages law enforcement officers in Florida to racially profile people of the Islamic faith. The Council on American-Islamic Relations in Tampa sent a letter Tuesday to state officials, asking them to sever ties with instructor Sam Kharoba. The trainer’s presentations are “full of inaccuracies, sweeping generalizations and stereotypes,” the letter said. Kharoba’s training manual says Islam favors war, not peace, and says countries with a 99-percent Muslim population are “ultimate Jihad-manufacturing societies,” according to the council’s letter. The council’s claims, Kharoba said, are baseless. “CAIR’s statements are manufactured distractions designed to shift blame onto the law enforcement agencies that are protecting the American people,” Kharoba said. Kharoba owns a for-profit company called the Counter Terrorism Operations Center. His company was hired by the Florida Department of Law Enforcement to offer the training sessions. The FDLE is reviewing CAIR’s concerns, spokeswoman Gretl Plessinger said. The department has “received positive feedback” from people taking Kharoba’s courses, Plessinger said. The FDLE, which organizes several training sessions a year for state police officers, had to cancel a few classes in the spring because of a lack of participants, Plessinger said. One of the canceled sessions was to be taught by Kharoba. Shibly said Kharoba’s manual and related presentations may have influenced local officers. People in Tampa’s Muslim community have reached out to CAIR, saying they were harassed by Hillsborough County deputies, Shibly said. Deputies are not taught or encouraged to harass anyone, sheriff’s spokesman Larry McKinnon said. “Racial profiling is not condoned here,” he said. No one in the Muslim-American community has contacted the sheriff’s office to say they were targeted by deputies, McKinnon said. “But if they did, we’ll take their complaints seriously and investigate,” he said. Kharoba also wrote that “every one of Osama bin Laden’s speeches is theologically correct according to Islamic theology” and that bin Laden was “simply following the path and the mission that Prophet Muhammad started 1,429 years ago,” the letter said. Kharoba said Muslim police officers who enrolled in his course never complained. “Approximately 100 Muslim law enforcement officers attended our training classes over the past 10 years and none of these Muslim officers complained or provided any negative review of the material presented,” Kharoba said. McKinnon said deputies attended four classes taught by Kharoba from 2007 to 2009. Relevant, useful information in any seminar is absorbed into the sheriff’s office’s policy and procedures, he said. “But we’ll censor anything that isn’t appropriate,” McKinnon said. www2.tbo.com © Copyright 2012 Media General Communications Holdings, LLC. A Media General company. Muslim immigrants with more than one wife will see an increase in their social welfare benefits beginning in 2013, when reforms to the British welfare system come into effect. Although polygamy is illegal in Britain, the state effectively recognizes the practice for Muslim men, who often have up to four wives (and in some instances five or more) in a harem. Currently the state pays extra wives in polygamous households reduced amounts of individual income support, in addition to the normal amount received by the husband and his first spouse. Under the new rules, however, the extra wives will be eligible to claim a full single person’s allowance (despite being married), while the original married couple will still receive the standard married person’s allowance. The changes are part of wide-ranging reforms to the welfare system that are being implemented by Prime Minister David Cameron’s coalition government, which admits that it wants to treat extra wives as single so that the state will not officially be recognizing polygamy as it is under the current system. Critics who had hoped the government reforms would do away with benefits for polygamy altogether say the so-called Welfare Reform Bill is simply opening up a loophole for polygamous families to claim more money from the state. The issue of Muslims with multiple wives claiming extra welfare payments has been steeped in controversy for years. In September 2011, a British newspaper exposé on the subject found that the phenomenon of bigamy and polygamy — permitted by Islamic Sharia law — is far more widespread in Britain than previously believed. The rapid growth in multiple marriages is being fuelled by multicultural policies that grant special rights to Muslim immigrants, who demand that Sharia law be reflected in British law and the social welfare benefits system. The exposé quotes two senior social welfare experts and is based on least 20,000 bigamous or polygamous Muslim unions in England and Wales. If the average size of such a “family” is 15 people, these numbers would imply that around 300,000 people in Britain are living in polygamous families. The multiple marriages have been encouraged by changes made to the British welfare system by the previous Labour government, which allowed Muslim immigrants to have a second, third or fourth wife (and in some cases five or more) treated as a single mother who can get a house and an array of other state payments for herself and her children. The exposé shows how Muslim men can take a new spouse from anywhere in the world, father any number of children with her, and have British taxpayers assume responsibility for this family’s upkeep and care. Although all marriages that take place in the United Kingdom must be monogamous, Muslim immigrants can and do employ countless evasions to practice polygamy without running afoul of British matrimony laws. Muslim men, for example, can marry their extra “wives” in an Islamic Nikah ceremony (temporary marriage), either in their own homes or in a mosque. Because these marriages are not officially recognized, they do not appear in government statistics, nor do they have any status under the law. As a result, the “single mothers” involved in these marriages are entitled to receive welfare benefits from the British state. Another technique is for a Muslim couple to marry legally under British law but then divorce, leaving them then to have a Nikah ceremony and continue living together. The woman will then be entitled to welfare payments as a single mother and the man can then bring another woman from abroad and legally marry her in Britain. Muslim men also cheat the system by bringing brides from abroad as nannies for their children, or as nurses for a sick relative. After the bride’s one year visitors’ visa expires, she then disappears into a tight-knit local Muslim community and is then entitled to receive welfare handouts. Apart from the “nanny ruse,” new female partners enter the country using tourist visas, student visas or work permits. They simply overstay the visas, which are normally for six months, and then remain in Britain, often hiding away in their husband’s home. The United Kingdom also recognizes polygamous marriages in which both parties, before they moved to Britain, were resident in a country where the practice is legal. Since the 2008 change the former Labour government made to British law, a Muslim man with four wives is entitled to receive £10,000 ($15,000) a year in income support alone. He could also be entitled to more generous housing and council tax benefits to reflect the fact that his household needs a bigger property. The result is that the more children produced by Muslim polygamists, the more state welfare money pours in for their wives and them. By having a string of wives living in separate homes, thousands of Muslim immigrants are squeezing tens of millions of British pounds from the state by claiming benefits intended for single mothers and their children. Those women are eligible for full housing benefits – which reach £106,000 ($250,000) a year in some parts of London — and child benefits paid at £1,000 ($1,500) a year for a first child, and nearly £700 ($1,000) for each subsequent one. The exposé describes, by way of example, a street in a Yorkshire town on which all the residents are Pakistani women with children living on social security. There is not one man living in the street. The report also interviews a Muslim woman who was deserted by her husband of 20 years when he went on holiday to Bangladesh and returned to say he was about to marry, in a Nikah ceremony, a girl of 19 whom wanted to bring to Britain as his second wife. “All over the place, in London’s East End, in Yorkshire towns, down the road, across the street, I see Muslim men taking second or third wives. I cannot count the number of times I have been approached to be a second wife myself by Bangladeshi men who know I am now on my own,” she said. The controversy over multiple marriages in Britain became a national issue in September 2011 with the publication of a hard-hitting essay entitled, “Polygamy, Welfare Benefits and an Insidious Silence.” It was written by Baroness Shreela Flather, Mayor of Windsor and Maidenhead, who was born in Lahore (now part of Pakistan) and was the first Asian woman member of the British House of Lords.